We had to wait a long time – more precisely eight years - for the fifth studio album of Swedish progressive metal masters Seventh Wonder, but finally ‘Tiara’ hit the shops mid October! 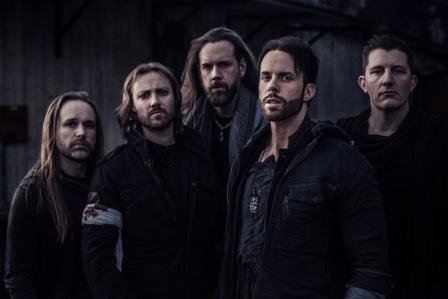 And yes, Tommy Karevik – who joined Kamelot in 2012 – is still the singer. To celebrate the release of this stunning album, we had a nice conversation with eloquent bassist Andreas Blomqvist about the reasons for this delay and many other things. They are back! Welcome back, it has been a long time! Thank you! That’s right, quite a while. I remember I did an interview with guitarist Johan in 2010 when previous album ‘The Great Escape’ came out in 2010. What happened after the release of that record? Did you actually play live for it? Yes we did. Not very much though. Some gigs were in Italy, others in Norway. We played in Sweden and we also did ProgPower in the USA. Right before that album came out, we had been working very hard. We did albums in 2005, in 2006, in 2008 and 2010. So I think at that point everybody was really tired and just needed to catch our breath. And then a bunch of stuff happened. Drummer Johnny Sandin quit the band, Tommy got the deal with Kamelot in 2012. It took a while to sort it all out and get back to play together. How did you feel when Tommy announced that he was going to join Kamelot? Well, I guess it was mixed feelings, kind of it is right now too. At that time we did not know what was going to happen. As I said, we did not have a drummer. When Tommy told me that he was joining Kamelot, I was in the United States for a while, so at that point there was not even a band. Since we like him so much, we were just happy that he would have the opportunity and experience. The other side was that once we started working together again, Kamelot was taking a lot of his time, making it more difficult for us to make progress too, but at the same time it gave us a lot of new fans and helped people to keep happy and interested in the band in all these years. It has been good and bad. I think so, I guess we all needed time off. We were very stressful and it was kind of intense that time and I guess that was also a reason for Johnny leaving the band… everybody was at each other’s throat. It was very stressful, getting everything done. I think it was the right decision, at that time anyway. Yes, that is right. Originally the deal with Lion Music was for three albums, so the deal was really completed with the release of ‘Mercy Falls’, but then we made ‘The Great Escape’ and we contacted them and said: ‘Hey we have a new album, it sounds like this, are you going to release it?’ and they said ‘Sure’. Actually they are rather easygoing and for us that was very easy too, since we had a great collaboration going on with them since three albums before that. 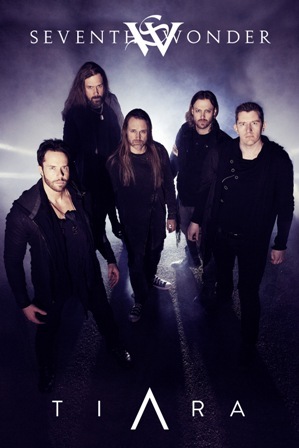 But since we got some more recognition after Tommy’s deal with Kamelot, we thought: ‘Maybe we can find a bigger label this time, with more possibilities, more reach.’ So we looked into some opportunities and decided that Frontiers was the best fit for us. We have always tried to keep things melodic. First and foremost that’s what we love: melodic hardrock. That’s what we all have in common. We pride ourselves that we can say that we like to play progressive music and our fans love it. We have difficult stuff with a lot of things going on at the same time and big arrangements. That’s a lot of fun and I could not imagine playing without it, but we can also create a song with just an acoustic guitar and still deliver a great song. So why shouldn’t we do that as well? That is an attitude we have from day one and we try to stick to that still. When was the time when you started to write ‘Tiara’? That has been a long process. In fact, one or two of the songs that ended up on ‘Tiara’ were written in 2011. Some of the drafts were even older. So we had two or three rough sketches for songs and then we noted: okay, we are not going to release an album in 2012, but in that year we started playing together again. We were not going to release an album in 2013 either, so we just recorded a couple of songs and that’s when we recorded ‘Inner Enemy’ and released it as a single in 2014. We were so far behind that we could not get out an album anyway. We said, well, we have to do at least something and that’s when we decided to do the ‘Mercy Falls’ live thing, a lot of fans had been asking about that for years, so we went to the USA to record that double live DVD ‘Welcome To Atlanta Live 2014’ and Frontiers released it. When that was done, including all the post-production, then we really focused on writing, it was mostly in 2015 that we wrote the songs and arranging all the things and stuff like that. We already started recording in the middle of 2016. You could say maybe that the writing process took place for 2011 till 2016, but most of it happened in 2015. For ‘The Great Escape’ you have written the lyrics. Was it also the case this time? Well yeah, I wrote them together with Tommy for every album and this time we collaborated a little bit more. Usually we just said: ‘Hey, you write this, I write that.’ Sometimes even: you write verse one and I write verse two, but this time we sat down together, spent countless hours and days and nights twisting and turning every little detail, so we really worked together for the lyrics this time, writing everything together. It took a lot of time and a lot of effort, but I really think it made us stronger. I have never been happier with lyrics and I think Tommy feels the same. We have a great working relationship in terms of stories and lyrics like that. It was a great experience. Well, it is both. Yes it is actually a full-fledged concept album, that is why it took a while. To write a concept album, we had to go back to the earlier stuff that we did. Indeed it is really a concept album from start to finish where Tiara is the main character or the protagonist in the story. Some of the sentences or riffs or musical things return a few times on the album. It is kind of referring here and there, that is the intention. Can you tell a bit more about the song made up of three parts, called ‘Farewell’? Sure. That whole trilogy – I always enjoy tooling with those kind of emotions - I think it was an interesting thing I came up with here. Basically let us say that the world is going under and there is only one person who can save it more or less and let us say that this person has to sacrifies herself for everybody. On one hand the entire world, all of the people over the world are going to be so happy and thankful, because they are going to see another day and that is the greatest thing that could ever happen. On the flipside of that is the situation of the parents of the child that’s going to be sent off. If they know what is going to happen, what a terrible situation. What are the choices? Either everybody dies or your child is going to be sent away and you’ll never see it back. What kind of tomorrow would you wake up to? That would be terrible of course. And thirdly, the person itself. How would she feel about this? That was kind of a take-on. We wrote the ‘Farewell’ trilogy from these three perspectives. The first one being the perspective of the people in ‘Tiara’s Song’, it is a kind of salute to her, a celebration of her for her bravery, the second one is from her parents point of view which is ‘Goodnight’ and the third one is ‘Beyond Today’ which is from Tiara’s perspective herself. That is the story of those three songs. (hesitating) Yeah well… Somebody has to do it, right? We produced it music-wise. Maybe the role that I assume is more the role of an executive producer in a sense that it is very important that we make all the arrangements together as a band, but when it comes to outlining the direction and basically getting everybody in the room, we are going to make an album, you write two songs, you do this, now I book the studio, making sure we have a place for mix and mastering, etc. Somebody’s got to be the guy who makes that happen and more and more that has become the role of me or sometimes Tommy and me to do that. But once again I want to emphasize that in terms of making the arrangements and the musical direction, that’s the entire band who does it together. The production here is not of a kind that we say: ‘don’t play that’ or ‘change that’. That’s not the point at all. It is more making sure that an album actually happens, you know. That’s the role we have assumed more and more over the years I suppose. You worked with Jens Bogren. What about this experience? It was only the mastering. The mix we did with an Norwegian guy Øyvind V Larsen at his Lionheart Studios in Oslo, mix is 99% of the work. The work of Jens Bogren was pretty simple, we never even met, so everything happened via the Internet. We had five test masterings and the whole band listened to them and picked out the one that sounded the best. That was Jens’s version at the Fascination Street Studios. So that is why we decided to use that and I think we are very happy with his work. Again you had the sister of Tommy Karevik singing on the album. Please tell us something about that? Both we and the fans love that. Tommy brings out the absolute best in her and I think she did a stellar performance this time. You know, when an album is 70 minutes long, it is hard to listen to the same old geezers over and over, so it is nice to have any changes. We tried to put some quiet songs in the middle, we tried a different vibe with ‘The Truth’ song and also Jenny and Mary added zests to the experience to make it a little more exciting. I think she really added something. We are super happy that she did it. Ah yes, that’s true. Stefan (Norgren – Vera), our new drummer does a lot of that stuff and I think also Johan, the guy who did the artwork was in there. There’s a bunch of people, but Stefan does all the low notes (laughs). He had big shoes to fill, but he has done a great job. It is great, because also on this album, it is the first time that both Stefan – obviously, because he hasn’t been on an album before – and also Andreas, our keyboard player, added original ideas and came up with brand new songs that made it to the album. Everybody wrote for this album and I think that is really cool. Are there already plans to play live to support ‘Tiara’? Oh yeah. We are in the middle of working on that right now, so there are no fixed dates, but right now we are trying to connect with bookers and promoters to figure out what to do. Most likely there is nothing going to be in the fall, but probably right after New Year we are gonna get going. We are now in the middle of deciding which songs we are going to play. We haven’t played for four years, so it is going to take a while to get us up to speed again and make it sound good. So we are back in the rehearsal room right now, learning the songs again and make sure they sound good. What can you tell about the making of the video for ‘Tiara’s Song’? Do you have plans for other videos? I don’t think so. Maybe. There will be some lyric videos and stuff like that, but I am not sure if there’s going to be another proper video. Maybe. We want to play as much as possible in the Spring, that’s priority number one. And we don’t want to wait another eight years, so at some point we are going to work on the next album too. We’d love to get the opportunity to meet our European fans and get down and play through Europe again. I really hope we get a chance to and if we do, I really hope that people will come out and say hi. We can’t wait to get out.